Have a question about our services? There’s a good chance you will find the answer you’re looking for below! Why do I need to wash my house? Your home is your greatest investment. Over time, the varying seasons in our area, along with pollen, dirt, mold, mildew and lichen will begin to appear on your house. Left untreated, they can cause damage and permanent stains to your siding. 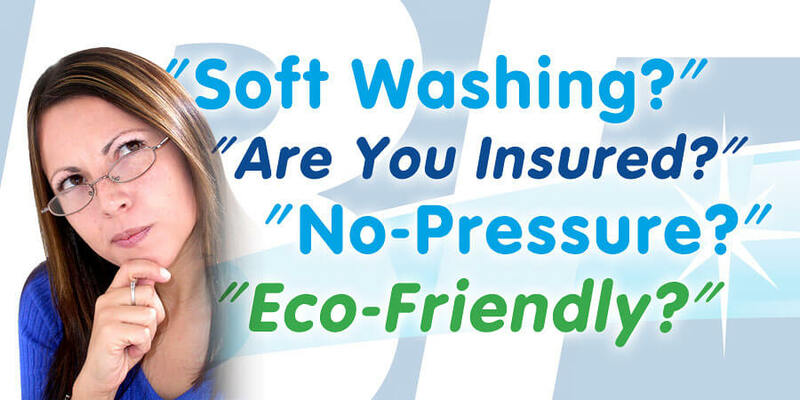 What is a “Soft Wash” House Wash? A Soft Wash House Wash is a combination of specialized nozzles and cleaning solutions which are applied and rinsed at low pressure. This process ensures there will be no damage to your siding, doors and windows. Vinyl siding manufacturers recommend that you wash your home every 2-3 years, though specific environmental factors around your home may require the service to be performed more or less frequently. What kind of cleaning solutions will be used? 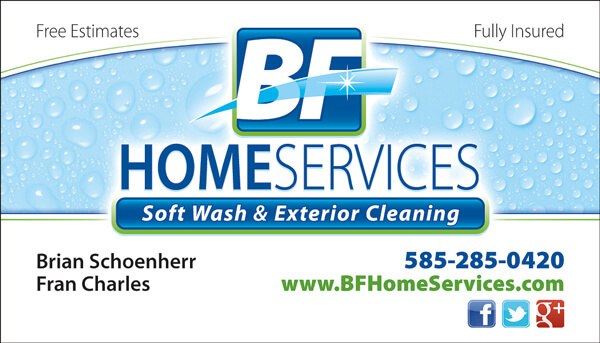 BF Home Services only uses environmentally friendly bio-degradable solutions on your home. Will these solutions harm my plants and flowers? We will water down all landscaping prior to, during, and after the wash process to ensure their safety. Your roof accounts for a significant percentage of your home’s overall value. Over time, dark stains and streaks (which are actually algae, mold, and bacteria growth) develop on roof shingles, usually on the northern slope. Left unchecked, these unsightly stains will spread across your entire roof and lead to the premature degradation of roofing materials. Regular roof cleanings will save you thousands of dollars off the cost of roof replacement. What is “No-Pressure” Roof Cleaning? No-Pressure Roof Cleaning is a combination of specialized nozzles and cleaning solutions which are applied and rinsed at low or no pressure. This process ensures there will be no damage to your roofing shingles. Roofing shingle manufacturers recommend that you wash your roof every 2-3 years, though specific environmental factors around your home may require the service to be performed more or less frequently. Do you offer standard pressure washing? Absolutely. While high pressure washing is not recommended for more delicate surfaces like siding and roofs, it is still the best way to clean tougher surfaces such as concrete, brick, and stone. Is my property in your service area? If you are located in the Rochester, NY or Monroe County, NY area, you are in our service area. However, in some instances we also service properties outside of our main service area across the Upstate New York Region. 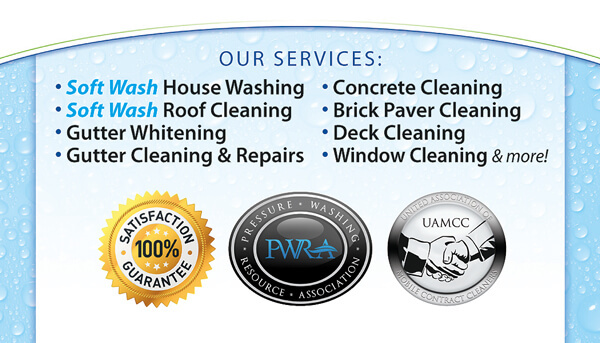 Feel free to contact us to find out if we can be of service to you. Even if we are not able to assist you, we will be happy to recommend a reputable service provider in your area who can. BF Home services is fully insured up to $2 million dollars for your protection. Don’t see your question answered above? Feel free to CONTACT US to get the information you need. We will be more than happy to help!